I live in Upstate New York. We have winter for 6 months of the year. Summers can be humid sometimes, but this year just takes the cake. Holy cow!!! What is going on with this crazy weather?! 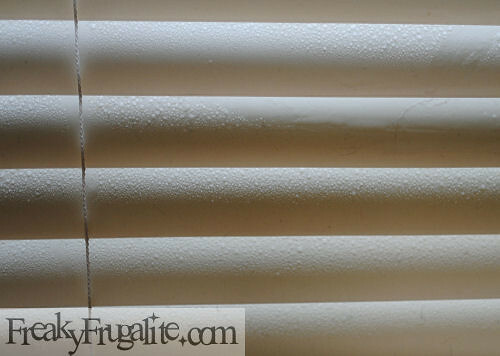 Oh my gosh– that’s WATER on my window blinds! My blinds are sweating!!! OK that is just totally freaky! All our fabrics here are damp. You have any idea how ikky it is to sit on the bed, and the sheets and pillowcases are sticky with moisture? It’s pretty gross. It’s even worse when I realize that my kitchen and laundry room are entirely gutted… and I have hang all clothing out on the clothesline. But it won’t dry! As a matter of fact, the clothes become ever wetter after hanging out on the line! Give me snow. Give me blizzards. I love winter, I love snow. I can breathe again then. And did you hear that fruits in California may not ripen because it’s been so cold over there? ← No If’s, And’s, or…. Yep, down here in SoCal, we are definitely having a cooler than normal summer! Finally this week, it’s gotten hotter, more like normal late August temps – pushing 100. I actually prefer a bit of humidity to totally dry heat, but what you have going on is ridiculous!